Here’s a curatorial quote about Ingres’ Studies for the Turkish Bath (1859-60),one of the collection of drawings hanging in show Delacroix, David and Revolutionary France currently on display at the Morgan. “In this large preparatory sheet, the eroticism of the Turkish Bath is anticipated in a series of lushly rendered figure studies drawn from life. The sheet seems to summarize Ingres’ ongoing fascination with the female body and reveals a more vigorous richly modeled approach than is typical of his drawings.” The austerity of the portraits of Madame and Monsieur Louis-Francois Bertin, publisher of the Journal de debats and a major cultural figure during the July monarchy of Louis-Philippe, testifies to the polarities of sensuality and severity within the character of Ingres. David Hockney once propounded the theory that Ingres used an optical device and the question with Ingres is always whether the lines are copied or found. Odalisque and Slave from l839, mounted in a separate exhibit of just Ingres drawings simultaneously on display at the Morgan, of course, poses another question entirely, how is it possible to produce a drawing that has the detail, depth and dimensionality of a painting? Two studies by Delacroix on the Death of Sardanapalus, one of his murders and the other of his spoils are brilliant exemplars of how the handmaiden to painting often exhibits a brilliance, modernity and freedom that, in the hands of a master draftsman, can outdo the painting itself. 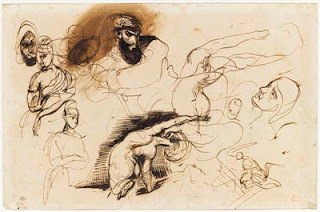 Gericault, Daumier are amongst the other artists whose works are on exhibited in the Delacroix, David show and it's an exhibit that's a testament to social as well as artistic revolution. Apparently Ingres said that the plaque above his studio should read Ecole de dessin.